I took myself to the city a few days ago for some much needed art therapy. 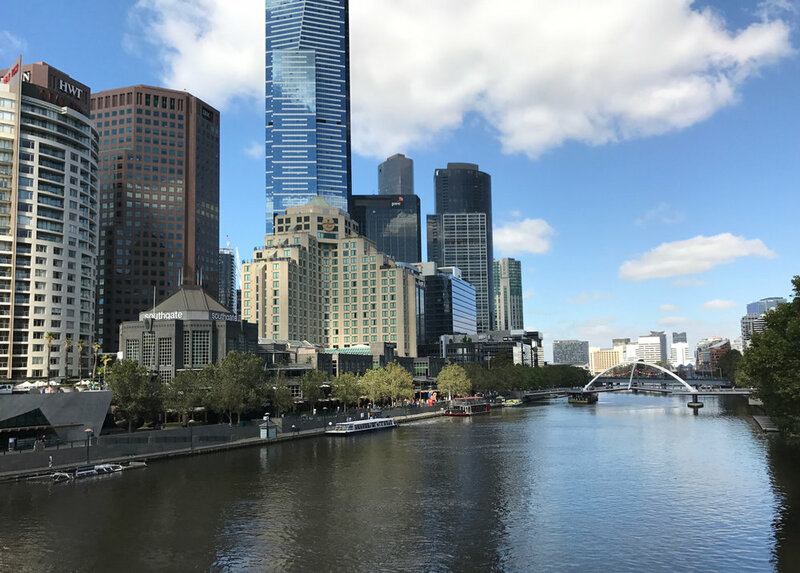 Recent world events, the ensuing barrage of social media outrage and the horrific Bourke Street pedestrian mall attack right in the very heart of my fair city of Melbourne have left me (and I’m sure many others) questioning the sanity of our world and feeling depleted and flat. It seems to me there’s an uneasy vibration to our beautiful planet at the moment in the wake of fear being used as a powerful weapon of control and destruction. As a result, many of us appear to be feeling unusually anxious and uncertain about what the future holds. And yet, wherever I look there are stories of inspiration and courage. Amongst the discord and chaos it’s been heartwarming to see compassion and humanity rise to the fore in response to very tumultuous circumstances. During these times, I try to come back to my centre in the knowledge I have unwavering faith in the human race. In the long term, I have no doubt love and goodness will prevail. Aways. Meanwhile in the studio, I've been working in the mono tones of black and white for the past few weeks while exploring portraiture as you may have seen last week in Overcoming fear face to face. As much as I love the delicious textures, contrasts and marks created through smudgy charcoal and dripping ink, the energetic beauty of colour is my great passion and is one of the most joyful aspects of painting for me. Magnificent art drenched in colour, however subtle or vivid, has the ability to transform my mood in much the same way as sunshine breaking through the clouds. Scientific studies like the ones mentioned here have supported this idea showing that cortisol (the ‘stress’ hormone) levels in the brain decrease in response to visiting an art gallery, regardless of your art knowledge or prior interest. That fascinates me! It brings me great joy to think that the wonderful international community of artists to which I belong is contributing to a reduction in world stress through the outcome of their creativity. Not to mention the therapeutic benefits of the creative process for each artist. 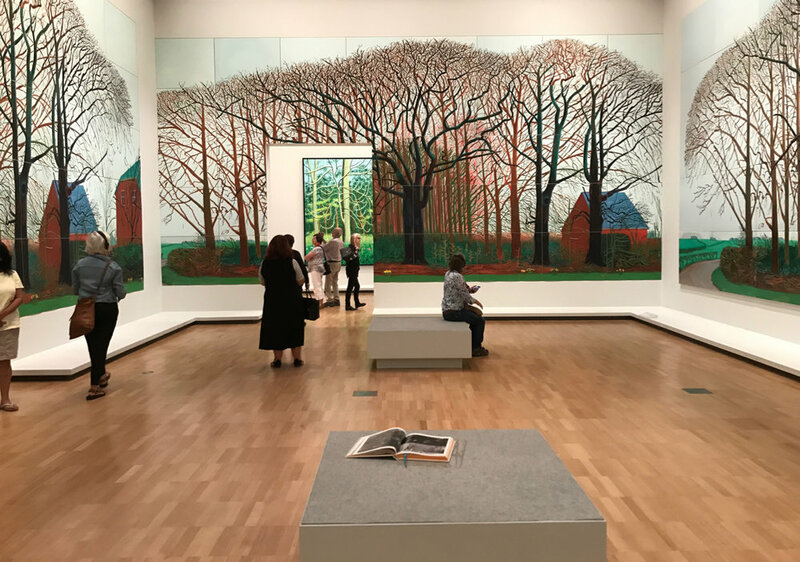 Last week I felt myself longing for a big dose of art and colour so the best remedy seemed to be a trip to the National Gallery of Victoria to take in David Hockney Current which is on show until March 2017. I’d love to share what I found in the hope of offering you some healthy mood enhancing respite and pure enjoyment in an amazing man's work. Before we arrive, here's a peek at the sights on route to the gallery. 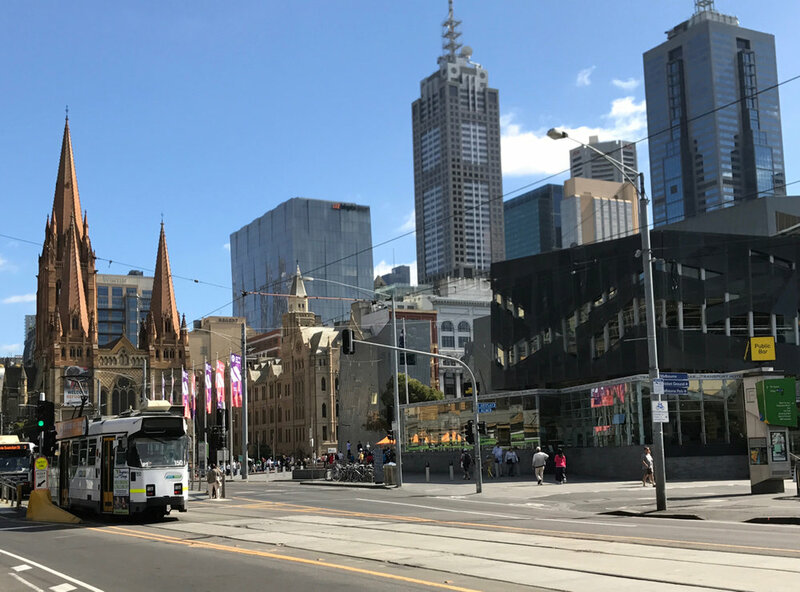 I love that our arts precinct is right in the heart of Melbourne. Hop off the train at Flinders Street Station, wander across the beautiful Princes bridge over the brown Yarra River, past Hamer Concert Hall, then the Victorian Arts Centre, home to The Australian Ballet, and you arrive at the National Gallery of Victoria, fondly known as the NGV, with its gorgeous waterwall window. It's a right of passage for all visitors to dip their fingers into its streaming beauty. David Hockney is referred to as one of the most influential English artists of the past century and one who is fearless in the pursuit of creative innovation. After seeing this exhibition I can understand why. His experimentation with technology, embracing the possibilities of iPhone and then iPad generated art using the Brushes app, all done during his seventies, is inspiring and wondrous. Part of the exhibition includes a large display of walled mounted iPhones and iPads scrolling with hundreds of images and animations of Hockney's creative process. The man's productivity is astounding! He has endless drive to explore the possibilities of what he can create using his thumb and later stylus on a sheet of glass, moving from his early iPhone to the iPad. I'm familiar with creative apps such as Brushes but had always considered them more as a helpful tool to play with composition or create rough studies for reference. Seeing the development of Hockney's digital work made me rethink the possibilities of final works of art. The importance of an artist's practice, working and working to explore and master a process and medium was reinforced to me too. Regardless of talent every artist is benefited by practice! Practice, practice, practice! Moving through the exhibition visitors are treated to huge printouts of some of Hockney's iPad art including the beautiful 'Arrival of Spring' and 'Yosemite' series. Many of these works are also displayed on giant electronic screens giving each a beautiful luminous quality. The colours glow and leap. Some are also animated, a perfect documentation of Hockney's process. It's quite special to follow his hand from initial strokes blocking in dark and light areas, progressively building layers of marks, creating depth and detail with such rapid and deft movements and, at least seemingly, no editing! It was mesmerising to watch and receive real insight to this great artist's intuitive rendering of nature which seems to have been his greatest muse. The arrival of spring in Woldgate, East Yorkshire in 2011, 2 June. A complete series of portraits painted during 2013-2016 is also on display for the first time anywhere in the world. Lucky Melbourne! All subjects are painted in acrylic. Each of them is in some way known personally to Hockney and are seated in the same chair in the same room. 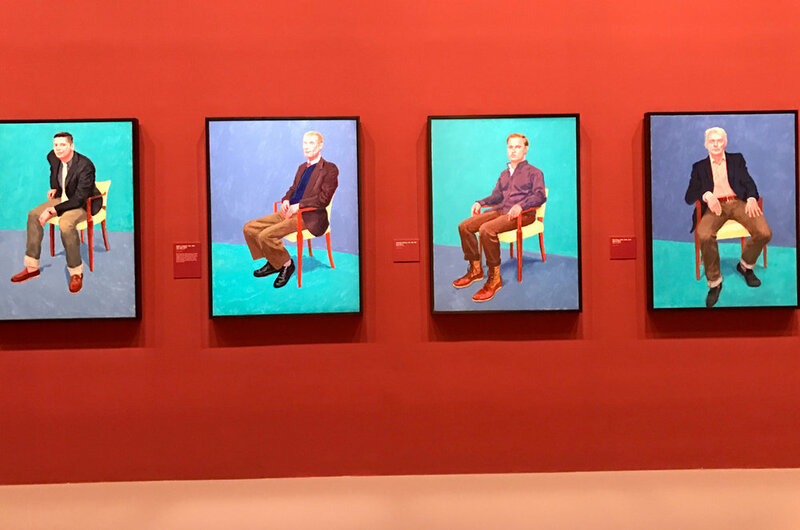 Each sitting took two to three days and what I found most fascinating was the way in which Hockney captured the body language of his subject. Some so relaxed and at ease in his company, others clearly nervous and others willing themselves to sit still for a little longer. Hockney sees this series as one work and it makes a very striking display walking through the long gallery. Another impressive exhibit was the 'Bigger Trees near Warter' installation comprising 50 canvases painted outdoors in oil, each depicting part of a larger scene. Hockney kept track of which section his was painting with the aid of a computer. He eventually jigsawed the pieces together into one giant work which is also reprinted and mounted on the three other walls of the same room, giving you total immersion within the art and the countryside it depicts. Hockney has also enjoyed playing with photography to create new scenes with multiple perspectives and vanishing points. One installation created from photos of people within Hockney's studio really challenges the visitor's sense of reality. I loved my experience of David Hockney: Current. I'm in awe of his ability to experiment in such a public manner, seemingly without fear of failure, to challenge our thinking about what is traditional, such as the landscape, in radical new ways, to apply colour with abandon and to embrace new technologies and explore their possibilities. But the beautiful app art left a small hole in my heart despite its stunning colour and masterful, expressive rendition of so many subjects. It dawned on me; I missed the texture of the paint. The lack of control over the medium. The random drips. The paint pooling and the areas of muddiness where colours mix without intention. The place where the paint brush skips and leaves a feathery mark. The lumpy smear of paint left by a palette knife. That unexpected magic that happens only on the canvas. There was a moment of recognition. I'm an artist who loves to be more than a little out of control. I realised there was a place close by where I could find some of that magic. So after spending several hours with Hockney, in a day of total art intoxication, I took myself over the road to NGV Australia for a second visit to the stunning exhibition of our own living legend, John Olsen: The You Beaut Country. I'll save the tale of that splendid experience for another time. Right now I'm going to take Hockney's advice to 'Shut up and paint!' I hope you have the chance to visit David Hockney Current in person. I can highly recommend it for all ages and there is far more to experience than I have shown here. Please remember you are very welcome to comment below. You will need to be logged in to Facebook, Instagram, Linkedin or a similar platform requiring registration in order to do so. P.S My dearest subscribers, thank you so much for your messages and emails and your warm response to The Artful Traveller. It makes me very happy to hear you are taking pleasure from my posts. I love creating them. However, in the interests of maintaining my 2017 commitment to Spaciousness, and to decrease the risk of boring the pants off you all, I'm making a small change. My studio practice and some forthcoming life and travel demands will mean I'll be making my posts a little less frequently over the next few months, though I still hope to keep in touch with you once a fortnight or thereabouts.